Based on linguistic and stylistic evidence, this cylindrical blackware Maya vessel is thought to have been looted from the site of Río Azul in Guatemala. It rests on three slab feet and has a matching lid. The lid is topped with a ceramic tube. 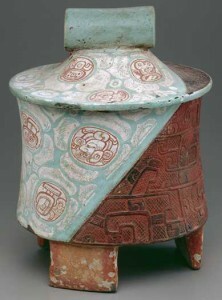 Both the lid and the body of the vase are decorated in a swirled pattern, partially carved with geometric designs, partially stuccoed and painted in white, red, and Maya blue. The painted portion contains a series of flowers, and in the centre of each is a glyph. The vase is thought to come from Tomb 12 at Río Azul as both the vase and the tomb bear inscriptions mentioning a person named Six Sky (Adams 1999: 93). This tomb is thought to have been opened by looters in the late 1970s as the building it was located in was recorded as intact by archaeologists before that time. The vase also bears the emblem glyph of Río Azul which very strongly links the vessel with that site (Adams 1999: 94). The vase was reportedly offered for sale, along with a fuschite mask, by the Andre Emmerich Gallery in New York (Salisbury 1986). It appeared alongside other artefacts in the possession of Scottsdale, Arizona businessman Peter G. Wray and was purchased by the Detroit Institute of Arts in April 1984 for an undisclosed sum thought to have been between $10,000 and $30,000 (Salisbury 1986). The piece remains in the Detroit Institute of Arts (accession number 1984.12.A) and is recorded as being a ‘Founders Society Purchase, Arthur H. Nixon Fund’ (Detroit Institute of Art n.d.). Detroit Institute of Art (n.d.), ‘Tripod Vessel with Slab-legs’, Website of the Detroit Institute of Art <http://www.dia.org/object-info/9feb1644-2f68-46af-a76b-9fa53aef695d.aspx?position=1>, accessed 6 April 2012.